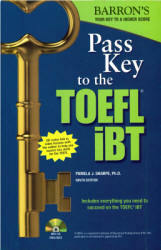 Pass Key to the TOEFL iBT. Sharpe Pamela. Barron's Ed. Series: 2016, 9th. ed. - 624p. This updated shorter version of Barron’s full-size TOEFL iBT test preparation manual prepares ESL students for the Internet-based test. An overview of the test format and a review of required academic skills that include note taking, paraphrasing, summarizing, and synthesizing A short review of skills in listening, speaking, reading, and writing in English Three model TOEFL iBTs, with answers, explanations, and sample writing and speaking responses The enclosed MP3 Audio CD presents audio prompts for the Listening, Speaking, and Writing sections of the book’s practice tests. There are currently three different packages for Barron's TOEFL® iBT. The book is the same in all three packages. 2. Barron's TOEFL® iBT Book with 2 MP3 CDs and 1 CD-ROM. Prepare using the audio for the practice activities and the quizzes. Use the CD-ROM for the 7 model tests in the book as well as for Model Test 8, which is a bonus test on the CD-ROM. The CD-ROM simulates the TOEFL® iBT tests on the computer, including the ability to record and play back responses in the Speaking section and save your essays. 3. Barron's TOEFL® iBT Superpack consisting of the Barron's TOEFL® iBT book with 2 MP3 CDs and CD-ROM, Barron's Essential Words for the TOEFL, Barron's TOEFL Strategies and Tips with MP3 CD, and Barron's Writing for the TOEFL /ВТ with MP3CD. All of the packages also include four video lessons for academic skills and access to a website that provides interactive pronunciation practice for campus vocabulary. *lf you wish to purchase the CD-ROM separately, please visit www.barronseduc.com for details.